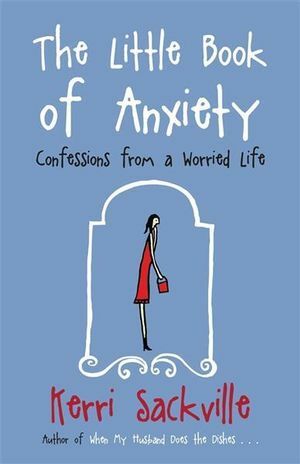 I am reading Kerri Sackville’s “The Little Book of Anxiety:Confessions from a Worried Life” and it is really funny and also really resonant. A writer for The Sydney Morning Herald, The Age, Sunday Life, Mamamia.com and also a prolific blogger, Kerri is no slouch in the writing department. Totally readable and not at ALL textbook flavoured. In just the first few pages, Kerri nails the anxious life. I don’t want to preach to you on anxiety and its causes and cures because it manifests in different ways and to different degrees for everyone. From the niggle in your head right before you want to sleep about whether you’re in the right job, to a fully blown panic attack over imminent disaster, there is the capacity in all of us for worry and anxiety to affect our mental and physical health. I know when I’m anxious, exercise helps. Not walking or running, as I know is the most predictable thing, nor boxing and exhausting myself. I actually find the big adrenaline rush from doing that can equally exhaust my anxiety out OR increase it massively! Not worth the risk. I actually find a flowing, moving vinyasa yoga class is really redemptive. I might find myself still highly emotional throughout class, but I feel like I have the energy and ability to acknowledge all those worries and fears and not to crumble and feel useless in the face of them. I feel re-energized. I also like a good weights session – again, not pounding the barbells and forcing myself through endless sets or huge loads – I’m not punishing myself! I just like the steady count of repetitions and the focus on timing, technique and focusing on how it feels rather than giving in to the “if this, then that” thoughts racing through my head. You will find you already have ways to handle your worry. Maybe you don’t even recognise that’s what you’re doing. The important thing is to make sure those ways aren’t harmful. I know those too. Exercise has been a demon for me in the past as far as trying to exorcise anxiety with exhaustive routines and classes and sweat. Another book has come out recently by Melbourne woman, Vanessa Alford, who exercised obsessively and was praised and prized for running like a maniac, overtraining and losing massive amounts of weight through restrictive and dangerous dieting. She has revealed the pain and misery that haunted her in Fit Not Healthy and it is a confronting, CONFRONTING book, I warn you. But one that reveals a culture and obsession that is evident to me in my role in the fitness industry. I don’t believe we have seen the real start, nor any great developments on this front and it will come. There are a great many men and women who will identify with Vanessa’s experience and are not willing to admit their demons just yet.